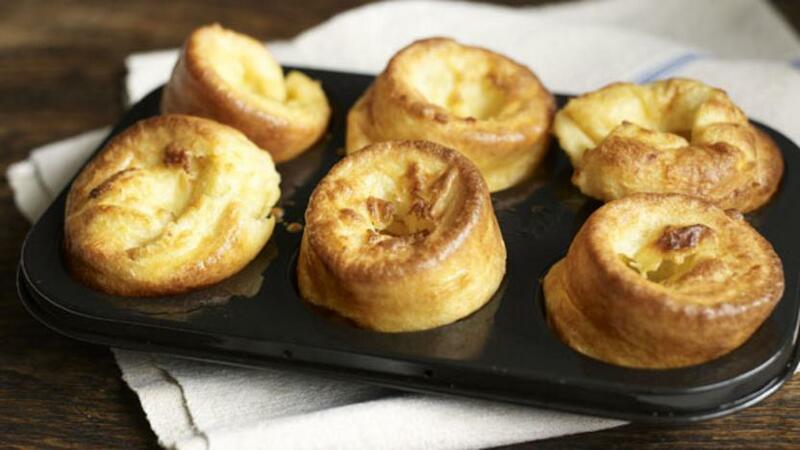 Let us show you how to make Yorkshire puddings that are tall, crisp and light every time. Use goose fat or dripping for extra flavour, but a light olive oil or vegetable oil is good too. Sieve the flour into a large bowl. Add the eggs and whisk in. Once incorporated, gradually whisk in the milk a little at a time, Whisk to a smooth batter, season with salt and pepper and then pour the batter into a jug. Cover with cling film and refrigerate for 30 minutes. Preheat the oven to 200C/400F/Gas 6. Put half a tablespoon of fat or oil into each of eight holes of a deep muffin tin. Leave in the oven for 5-7 minutes to minutes to heat up, or until the fat is smoking hot. Pour the cool batter into the holes dividing it equally and return to the oven. Cook for 20 minutes without opening the door, then check and cook for a further 2-3 minutes if necessary or until golden-brown and risen. Remove and serve immediately. You can make these ahead for a no-stress roast dinner. Cool completely on a wire rack and then freeze in a sealed plastic freezer back for up to a month.